Photographer: Charlotte Wales. Model(s): Maartje Verhoef. Source: Vogue UK. Stylist: Verity Parker. Makeup: Val Garland. Hair: Syd Hayes. Maartje Verhoef is amped up and ready to go in ‘Fully Charged’ by Charlotte Wales for Vogue UK, 03/17. It’s not often that we come across an editorial with four images that feel full. Here we have a story bursting at the seems, signalling the succulence of Spring coming our way. This season we have art and excess barreling toward each other at the speed of light. And, while that may feel like a furious ride, I’m here to tell you it’s right where you wanna be. Stylist, Verity Parker, seizes on the opportunity to fly with fashions that hold nothing back. Unique in presentation, each style is outfitted with elements that drive the story forward. Colors come with a crispness that captures our imagination, while graphic patterns present in such a way with an open zipper fully on display. Bold red bursts on the scene with a ruffled blouse that feels nothing like its predecessors. While leather lures us in with a celestial blue done with diamond shapes cradling letter cut-outs. What was once considered fashionable has taken a turn toward tomorrow. The element of uptight has been replaced by the idea of structural defense. That’s to say, we haven’t gotten rid of the construct we’ve merely tapped into the fabric momentum. Matchy-Matchy never felt so divine with cool color combinations that connect in kind. A bold backdrop provides just the right amount of energy, as Val Garland ventures toward the forward face. A new take on the presentation of monochrome makeup. What was once considered a color flush, is now seen as a specter of similar shades. Dynamic pigment options look as if they’ve been painted on, as red revels in the richness of lips and lids. Shadow screams over the eyes with shades that don’t stop, while shine isn’t left behind with brilliant tones that make ~ Pretty Pop. Clean is the thing with a palate that really pops, as Saffron brings a twist of lemony goodness lined with azure and lime. 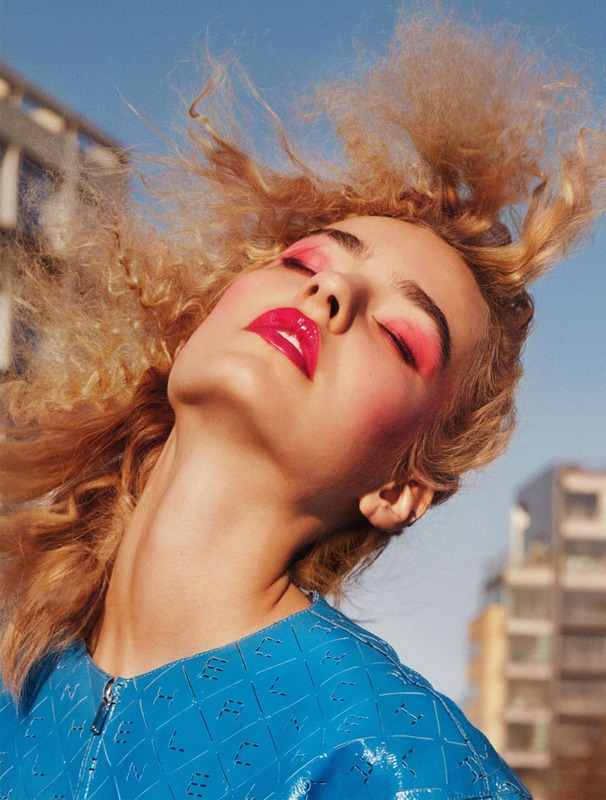 Maartje flashes lashes of electric blue while kissing with lips of a cherry hue. Features will have you dropping your jaw, with color combinations that cast you into next century cool. Bold brows provide a beautiful boundary, as the eyes are covered in nothing but blue mascara. 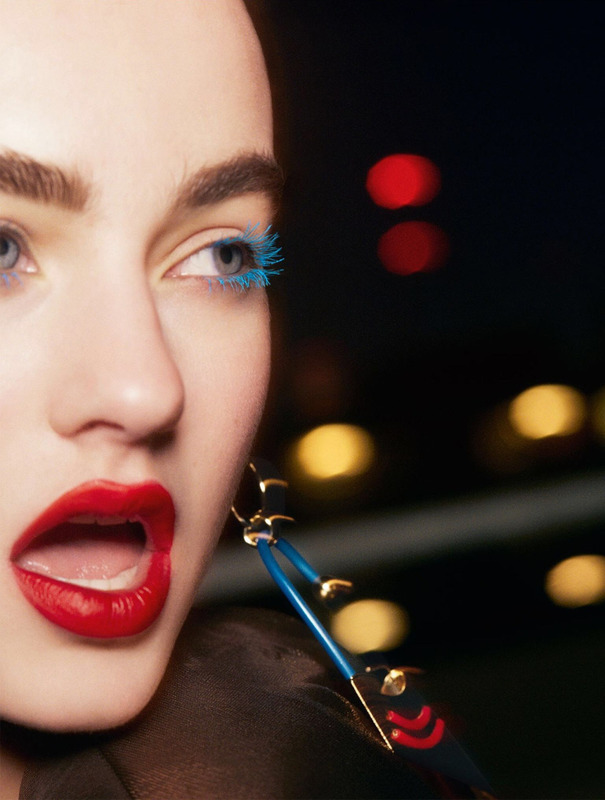 The art of electricity penetrates the page sending us into a neon induced rage, as glossy red gives us some of the most optically enticing lip pics we’ve seen this season. Syd Hayes creates chaotic curls that capture the vintage momentum. Spring 2017 embraces the 80’s theme with hypnotic shades that transform the scene.